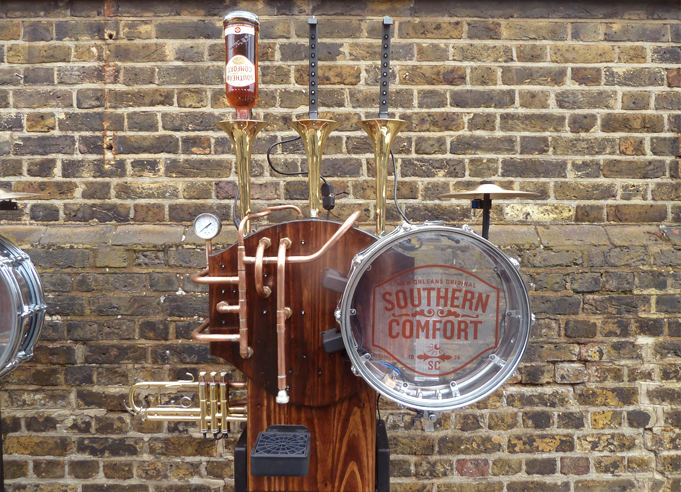 This project was commissioned by Frukt Communications, on behalf of Southern Comfort. 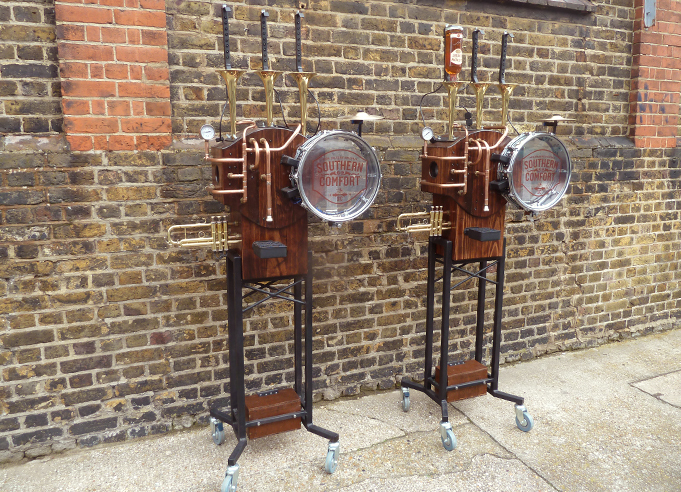 The brief was fairly relaxed, but the main idea was to produce two sculptural machines that could be taken to various venues to play music, attract attention, and dispense free drink samples. 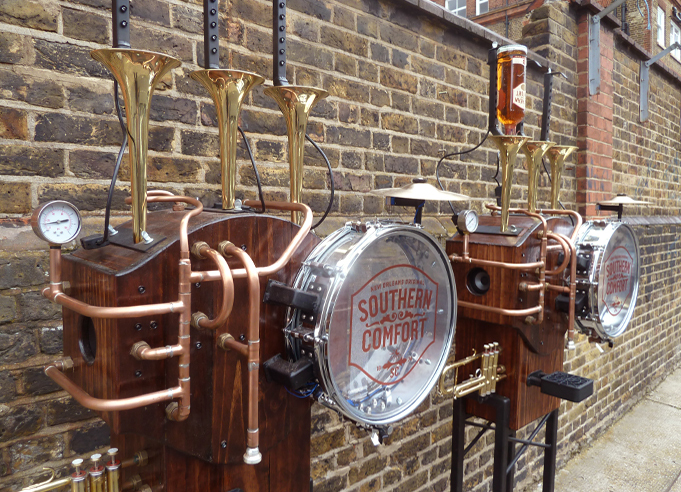 It was suggested to incorporate various instruments traditionally associated with New Orleans, to emphasise Southern Comfort's background. The very first thing to look into was an accurate catering grade liquid pumping system - surprisingly difficult to find one that didn't run on CO2 or compressed air. Eventually found a system in the US that ran on 12V, which would be much more portable than carrying canisters or a compressor around. 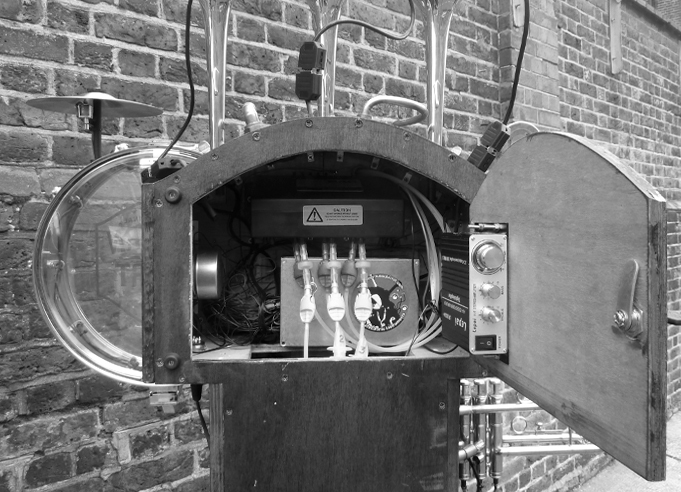 Various elements to be controlled within the machine included switches, pump motors, flashing lights, and solenoids to activate the snare and cymbal. Decided that this might be a good excuse to begin learning Arduino (an open source microcontroller, basically just a little computer that you can instruct to perform a series of simple tasks depending on certain conditions). I did begin learning the basics, but my brother wrote the programming in the end because he's very good at that sort of thing and a nice chap. Also found a dedicated Arduino-compatible MP3 player to supply some music during the dispensing process. It is made by SparkFun, and just slots into place on top of the Arduino board, with a micro SD memory card containing the audio files. This worked well, hooked up to a powerful little amplifier within the casing of the machine. One issue with the electronics was that the 43 LEDs were driven by a multiplexor chip, allowing far more LEDs to be individually controlled than there are outputs on the Arduino, but for some reason the multiplexor could drive an LED but not a transistor (needed for the pumps and solenoids). This was solved by incorporating some light detecting circuitry, as there wasn't time for major technical investigations. I will investigate the correct solution now that I have more time. This brought the chain of triggered items to: Switch, Arduino, multiplexor chip, LED, LDR, transistor, relay, and finally the solenoid or motor. The only elements not incorporated were a candle burning a rope with a weight, maybe releasing some pepper to make a chaffinch sneeze onto a windmill. I am usually very weary of involving so many stages, as each stage brings in an extra dimension of uncertainty, but it did function beautifully in the end. Mechanical processes are better, as you can analyse everything in front of you - cam sequencers rather than "magical cornflake" micro SD cards. 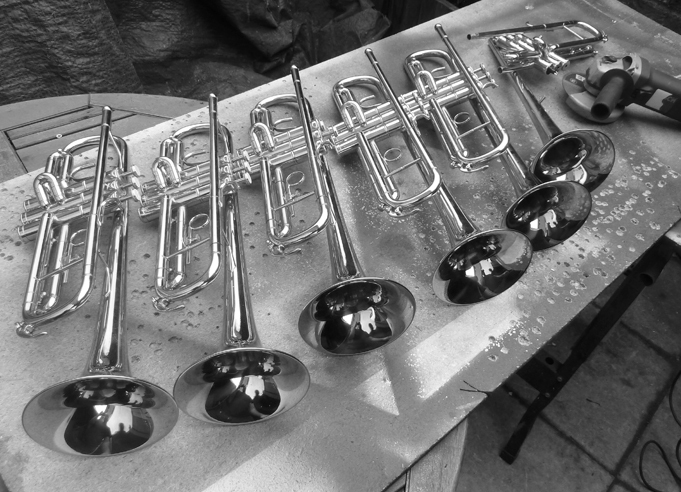 Electronics aside, the sculptural elements of the machine were fairly straight forward, apart from dealing with the guilt of cutting up six brand new trumpets. The timber casing was made from kindly donated packing crates. 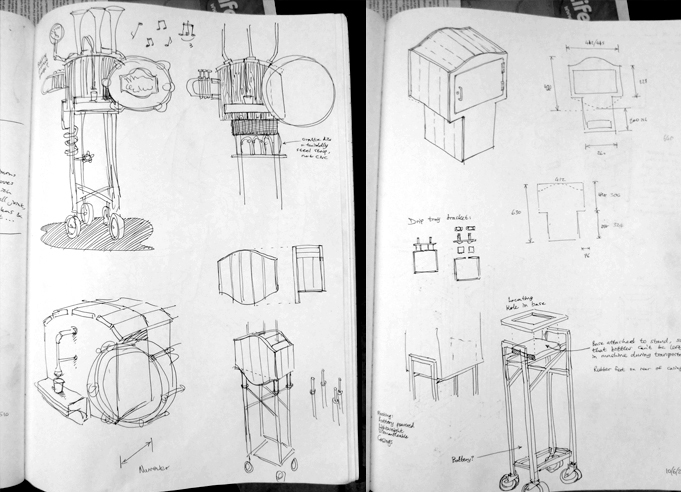 I had thought of using crates as part of a deliberately rough aesthetic, but the timber was immaculate, having only been used once to deliver reams of paper to a school. The copper pipes were fun to play around with. There are some great YouTube videos on the manufacture of brass instruments, and they show all kinds of clever pipe bending methods, including filling the pipes with bitumen or ice to prevent the walls of the tubing from collapsing. Another process of straightening out the walls is to clamp the section of tubing in a metal U-shaped former and force steel balls through the centre of the tubing. The size of the first ball is the same as the final inner diameter of the tube, and the balls that follow are slightly smaller, used to push the first ball along the tube, straightening out any irregularities as it goes. Setting up each machine involves lifting the top section onto its stand, connecting the power lead that travels through the frame from the battery, and attaching the three trumpet/bottle assemblies. Everything attaches with M8 'shouldered' thumb screws - no tools required. There are three independent pumps within the machine, so that three flavours of drink can be dispensed. The bottles held above the trumpet bells are for display purposes only, the actual bottles from which the liquid is pumped are housed within the lower section of the casing. 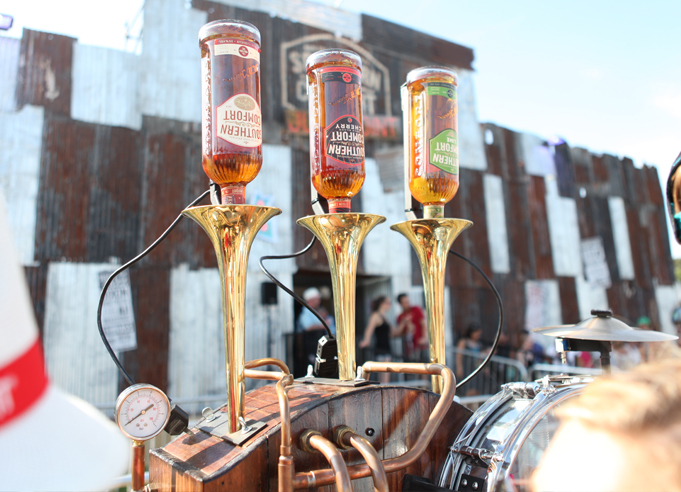 Once this is set up, one of three trumpet valves can be pressed, which begins the entertainment. 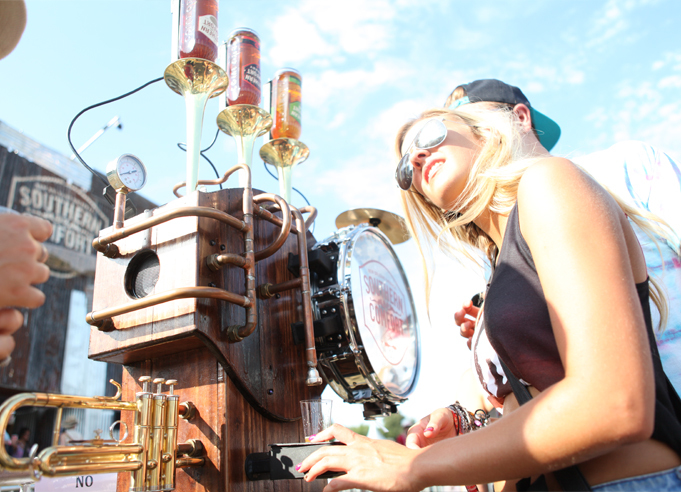 An MP3 is selected at random and begins playing, 43 ultrabright LEDs flash in sequence behind the selected bottle and around the snare drum etc, the drum and cymbal are struck by solenoids, and finally the pre-set amount of liquid is dispensed. This takes about 14 seconds, but the speed can be adjusted via the Arduino code. The machine only recognises one button press at a time, so that a shot glass is not overfilled by people pressing 3 buttons simultaneously. This sort of thing will happen regularly, as any interactive sculpture brought into a public place presents a fascinating challenge to attempt to break it as soon as possible. It's also an interesting design problem, to try and pre-empt how it will be misused, particularly as alcohol will also be involved. At least the machine will be accompanied by a member of the promotion team. (A few years ago I took part in an exhibition at the South Bank Ether Festival, which involved a number of sound installations, including 16 custom theremins created by Fred Mundell. The finishing touches were added to the various pieces, the rope barriers were removed, and in less than 120 seconds a member of the public walked up to one of the theremins, pulled the antenna like a lever, placed the snapped antenna on top of the casing, shrugged, and walked away fairly unimpressed. This is not entirely the fault of the person visiting the exhibition, as it's very hard to get people to quickly absorb operating instructions, especially for something as conceptually unusual as Lev Termen's creation). Thanks to Rachel for the timber, Pat for the awesome sound design, and Philip for writing the Arduino code and sorting out the multiplexor.